Designed to fit Numark NS7II and NS7III DJ controllers, the ProX XS-NS7IIIWBL black-on-black flight case is manufactured with heavy-duty materials for professional use. You depend on your gear to perform at its peak, and this rugged case ensures your controller stays in peak condition, gig after gig. 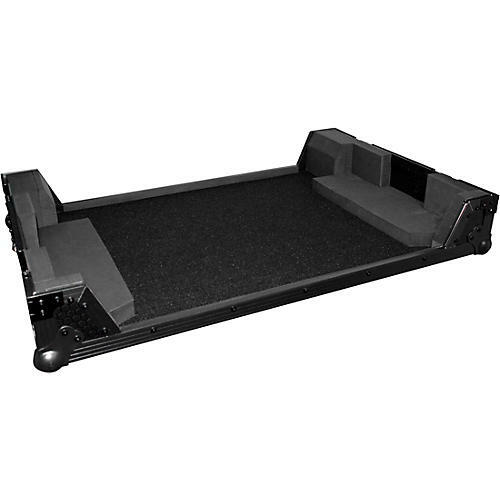 The ProX XS-NS7IIIWBL road case is constructed with ProX’s rugged, signature 3/8 in. Certified Gig-Ready Series plywood. It features durable rubber Penn-Elcom wheels, reinforced steel ball corners, as well as recessed steel padded handles and latches. Additionally, there is extra space behind the controller to safely store your cables and small accessories. The removable front panel allows easy and immediate access to the front controls and headphone inputs. As if manufacturing high-quality products wasn’t enough, ProX also strives to be environmentally friendly. The durable hard rubber foams used in ProX cases contain 70% recycled content. Of that 70%, 80% of it comes from recycled plastic bottles and the remaining 20% from recycled post-industrial material.